But, I’m anxious to share this blanket and remember how I did it, so when I do it again I will have a pattern. I used Hobby Lobby Yarn Bee Soft secret yarn with a “I” hook to achieve this look. Other yarn I recommend is Caron Simply Soft. Chain 6, in the 4th chain from hook, DC, then DC in remaining 2 CH spaces. then CH 6, in the 4th chain from the hook DC, then DC in remaining 2 CH spaces. You should have 2 little squares, now here is where it is tricky– flip the first square so that the starting tail is in the bottom left hand corner, the tops of those DC’s line up with the last DC you made and slip stitch into the first chain three space you made. So confusing, I know, but what you are trying to do is create one square with the DC horizontal and one vertical. So, if you get that, after you slip stitch, chain three and DC 3 more times all in the same space. You just made the third square, the very first square you made should be horizontal, with the tail hanging bottom left. The other two squares are vertical. Turn, but this is tricky again, slip stitch under the three chains of the previous square. Also you are twisting the square you just made so the dc are facing the opposite direction (horizontal vs vertical) Take the time here to wrap your mind around that and finding those three chains and turning will be easier. CH 3, DC 3 more times, slip stitch into next chain three space. Repeat. Now you have three squares across. Repeat the turning process (CH 6, DC in 4th chain from hook, 3 more DC) and repeat another row, making 4 squares across and continue on from there. To make a heart, you will have to grab some graph paper and sketch one out. On an 8.5 x 11 piece of graph paper, the largest square I could map out was 32 squares x 32 and I drew a heart in the middle. Here are some tips for changing colors. Have three balls of white yarn and two of the teal, and this is why, you will be changing color and then not fastening off, but picking up and using the yarn when you turn and come back around. 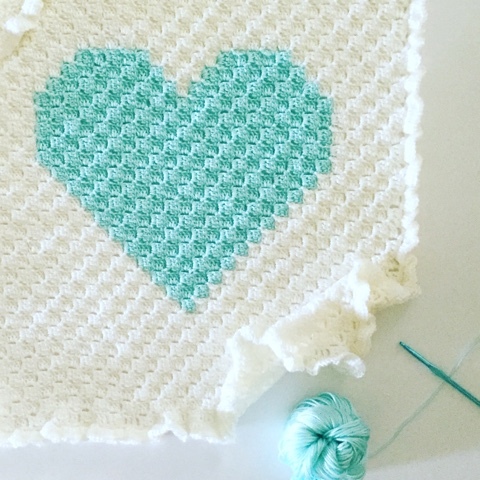 So, you will join with a new color, crochet the number of squares on the pattern, pick up the white with a new ball of yarn, finish to the end and turn, then pick up the teal on your way back and then join up again with the first ball of white yarn. There was a point in the heart where a third ball of white (small) helps to carry the white across in the point. According to your pattern you will get to the point where you will need to not add anymore rows, but decrease. When you get to that point, don’t chain 6 and create a new square, instead, turn, slip stitch across the square you just made and then slip stitch into the ch 3 space and dc 3 times and make a square right next to that one. SC around the edges one time, slip stitch to beginning SC, CH 1 turn. 4 DC in next SC, 2 DC in next, repeat all the way around, slip stitch into first DC, fasten off. Corner to Corner crochet creates a square blanket. Tag me on Instagram @daisyfarmcrafts so I can see what you are up to! Or use #daisyfarmcrafts and let’s all share in your pain! And then growth! And then cheer when you’ve got it all figured out!!! *Update: This is a graph for a second blanket I did that turned out more oblong than perfect square. I just used a piece of graph paper and sketched a heart right in the middle. It’s 41 blocks across, 33 blocks down, the edge of the heart starts 11 blocks in. I hope this graph can give you an idea as to how to make your own. The finished blanket turned out to be 36 inches by 28 inches. It is a baby blanket size.